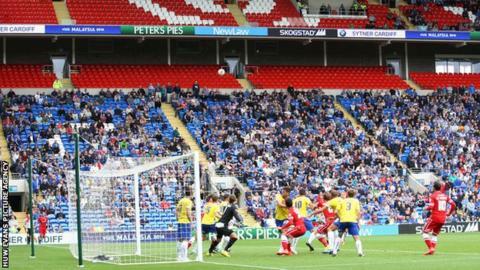 Cardiff City Stadium's Upper Ninian Stand has been sparsely populated since opening in August 2014. Cardiff City Stadium's new £12m Ninian Stand extension will be temporarily closed for club matches next season - less than a year after it was built. Poor season ticket sales after a disappointing Championship campaign have contributed to the decision. Fans who have bought seats in that area will be offered a move elsewhere. The expansion increased capacity to around 33,500 and was finished in time for the Real Madrid v Sevilla Uefa Super Cup last August. Cardiff averaged crowds of around 27,000 in the Premier League last season, but their relegation impacted attendances. Despite the bigger capacity, crowds have regularly dropped to less than 20,000 in the Championship this term. A club statement read: "At this time the Upper Ninian Stand will not be in use for the 2015-16 season. "All season ticket holders who have already purchased 2015-16 seats in this area will be personally contacted to discuss moving seats." The stand will be available for Wales' Euro 2016 qualifying matches against Israel in September and Andorra in October.